Campmor is a private company that specializes in outdoor recreation,equipment and clothing, which was founded in 1978 in Bogota, New Jersey. They're currently headquartered in Mahwah, New Jersey, US, and have two retail stores in Paramus and at their corporate headquarters in Mahwah. A large portion of their sales are made online at CampMor.com, which was launched in 1998 as an outgrowth of the catalog. It all began when founder Morton Jarashow started selling camping items and surplus army gear from his family's paint shop, after returning from WWII where he served as a B-24 gunner. A lot of the gear had began to grow mold due to poor storage, so they were able to buy in bulk, clean the items up and sell them at a markup. Today the company makes between $20 and $50 million in yearly revenue and employs under 500 people across its stores, website, and supply chain. Outdoor sporting equipment stocked by Campmor include heavy duty apparel, practical footwear, tents of all sizes, sleeping bags, packs, and other gear. This includes action cams like the GoPro, binoculars, camping seats, roof racks, child carriers, compasses, and climbing equipment (ropes, harnesses, shoes, helmets etc). Apparel caters to both men, women and kids, and includes shirts, pants, shorts, dresses, swimwear, running clothing, and much more. Campmor sells many popular and lesser known brands, as well as their own in-house items. Well known brands include Black Diamond, Columbia, Deuter, Jansport, New Balance, SmartWool, Thule, and many others. Campmor accepts most major credit cards for payment, including Visa, MasterCard, Discover, and American Express. You can also use their branded gift cards for all or part of your order. 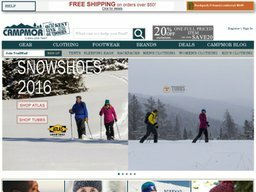 Campmor has free standard shipping for all orders over the value of $50. Below this threshold standard shipping costs $6.99. Other options include 2 Business Day shipping ($21.99), and next Business Day shipping ($29.99). Alaska, Hawaii, and Puerto Rico must add an extra $6 on top of the regular shipping prices. Your order total must be over $16 to ship to Canada. Campmor's return policy is for all resellable condition merchandise acquired within one year of purchase with a receipt. Defective items are also eligible for an exchange or repair, even if you have worn or used them.